Wolf Laurel Resort was founded in 1965, opening as a 5,000 acre resort/golf & ski development located 27-miles North of Asheville, NC with elevations ranging from 3700′ to 5600′. Today it is home to the Wolf Laurel Country Club, featuring its 18-hole golf course, along with the cherished Wolf Ridge Ski Resort, which is why it is no surprise that one of the most popular activities in the area is skiing. 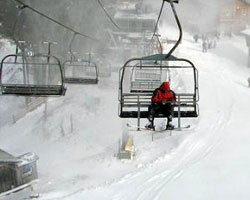 Our area is a haven for snow lovers as Wolf Ridge Ski Slopes operate within the resort boundaries. Offering great terrain for all snow sports, it has over 82 acres of skiable terrain, a new terrain park, and the new quad lift. Fourteen inviting slopes are offered featuring varying degrees of difficulty to accommodate the novice beginner and the most experienced expert skier or snowboarder, so there is something for everyone. The longest run is approximately one mile, and the overall vertical drop is 700 feet! Wolf Ridge NC ski area offers excellent package deals including lessons, rentals, and lift tickets, both for groups and individuals. If you’re not ready to hit the slopes alone, don’t fret. Put your trust in the experts, who will teach you the techniques and send you on your way to becoming an accomplished skier or boarder, all at a reasonable hourly rate. The resort is remarkably accommodating to any and all who wish to visit. From large groups to those not interested in skiing, Wolf Ridge has a place and a way for you to enjoy the snow. There is room for everyone on the NC ski slopes, and snow tubing is offered as a fun alternative. When planning your next trip to Wolf Laurel or the Mars Hill area, be sure to set aside some time to take part in some of the best skiing in North Carolina at Wolf Ridge. Contact Wolf Mountain Realty, and we’ll help make your stay more memorable with one of our enchanting vacation rentals at Wolf Laurel. Enjoy breathtaking views of snow-covered mountain peaks, and easy access to the slopes and all of the nearby attractions in Mars Hill. Give us a call today to book your cabin and get ready to enjoy the splendor of Wolf Laurel.